Pulling a play from Saul Alinsky's "Rules for Radicals," the students in the Hollywood Schoolhouse's Leadership Class successfully used the threat of a student march down Fountain Avenue to Councilman LaBonge's office, at first getting his attention, then getting his support and finally getting a promise of a four-way stop sign at the intersection of Fountain and McCadden. Not only that, it came with the assurance from LADOT Assistant John Fisher that it would be installed within two weeks. The best part is, the march never took place. At first rescheduled and then finally cancelled, the students instead held a Thursday afternoon rally on their playground and hosted parents and LaBonge. It's a good thing the kids never marched because the sidewalk from the school to the Hollywood Constituency Center is narrow, uneven and broken. Add the uncrossable streets and the intense traffic and the route was hardly suitable for a protest march. Of course, that's the point. Fountain Avenue is hardly an appropriate route for pedestrians. Yet that's the route the kids take every day when they walk from the school to their educational garden several blocks away. All on 3rd world sidewalks, past the neighborhood liquor store and alongside the traffic that weekly sends a car careening onto the sidewalk, into a fence or across somebody's front yard. 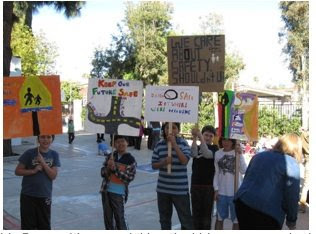 Debbie Wehbe, President of the Central Hollywood Neighborhood Council, reports "the area is simply not safe for pedestrians, not just because the intersection is dangerous to cross but because the cars speed around each other, causing collisions that occur on a regular basis." Wehbe pointed out the scarred fence, the skid marks and the narrow sidewalks that bear witness to the vulnerability of the pedestrians who dare to walk alongside the heavy traffic. "The last accident had a motorist racing at 45 mph from one stop sign to the next stop. It's madness!" Brent Becker, a parent who has been involved with the school for 9 years reports that there was some opposition to the 4 way stop signs but countered "It won't slow down traffic, it's already at capacity. It will simply make it safer for our kids to cross the street." The Hollywood Schoolhouse has been in the neighborhood since 1945. It has grown, just like the neighborhood and it sits in one of the most densely populated areas of Los Angeles and it suffers from some of the most intense cut-through traffic in the city. Stephen Bloodworth, Head of School, was proud of his students explaining "Our school has a long history of civic engagement and in the tradition of its founders, we offered the students in the Middle School Leadership Elective class the opportunity to select a project. They organized themselves around the public safety initiative and selected the intersection of Fountain and McCadden for the focus. They wrote the speeches you heard today, they made the signs you saw today and they wrote the letters that drew the attention of our Councilman, all of which culminated in this victory for everybody." Bloodworth was beaming as he surveyed the his students and declared "This is a great civics lesson that furthers our mission and makes it safer for our kids to go to school."